Sorry for the misleading title, but this post is not going to be about Katniss or Gale or Peeta or the love triangle of Galniss vs. Keeta (the other possible combination of names never mind). The picture you see is of my dad, 6 days in to his fast. 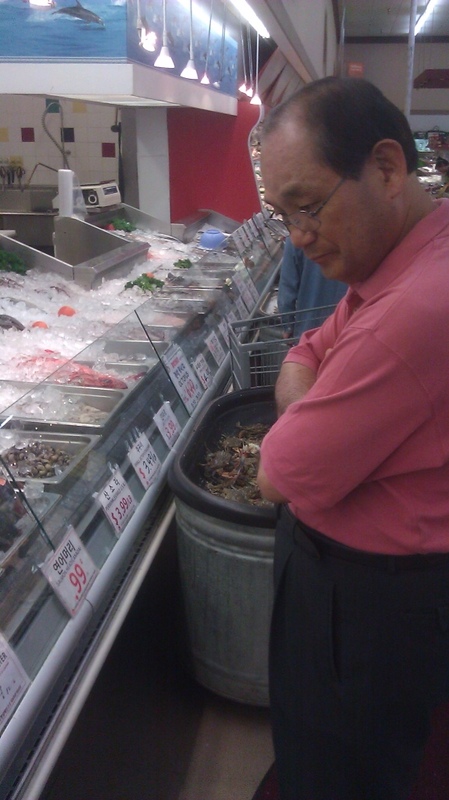 Every time he fasts for a lengthy period, he wants to take frequent visits to grocery stores (particularly Asian ones, because they have live fish/seafood) to stroll through the aisles and take in all the sights and sounds. He lost his ability to smell when he was a child, so he doesn’t have to worry about being overwhelmed by smells. We went to see him and also to celebrate Mother’s Day a day earlier, which my dad insisted that he’ll come to dinner with us to converse with us and watch us eat (which is another one of his favorite things to do while fasting). He wanted to go to the stores to see if they carry a certain “product” that he can cook and eat when he is able (I don’t want to let you know what it was because even I was a bit grossed out. I guess that’s why we went to Asian grocery stores. And no, it’s not dog). My mom usually go on these outings to entertain him. She said after all these years of fasting, he never once cooked or prepared the things he was craving when he was done with the fast. And much like my father, after the fast, I never followed through, either. When you’re hungry, everything changes. The food looks better than ever. You sit there and watch the cooking shows, and you swear that aroma of what the chef is preparing is coming through the TV screen. I started making plans – a food schedule, if you will – of what food to consume and in what order, when I am able. Burgers, fries, pizza and Mexican food usually tops the list. Oh. Ice cream. Pie.Cereal. Oatmeal. Cake. And the weird thing is, outside of ice cream, I don’t even like the stuff on the second list. But, during the fast, I would crave them. But once I was able to eat, those pangs would fade away rather quickly. Time spent watching the Food Network would decrease dramatically. It’s a different story, now that my hunger has been satisfied. While watching my dad make plans of cooking that he’d never follow through on, I started to wondering if this generation (mine included) could be one of the most idolatrous generations to date. Because, we Christians may hunger for God, but we end up filling up on something else completely. It’s like you’re at a great steak restaurant, but you ate so much of their complimentary bread, by the time the steak comes out, you’re too full to enjoy that great piece of meat (vegetarians can substitute steak and bread for what y’all consider as great and yummy as steak). Some of us may just be too blessed to realize that all blessings come from God and slowly start replacing God with ourselves; that my security and success came from my hard work and my talents. And we look ourselves in the mirror, and give ourselves the credit for looking so darn good. So, we go day to day to day replacing God with human created things (sometimes purposefully, sometimes unintentionally) and we start rationalizing and justifying for the things that are slowly replacing God. I don’t want to make light of the deep problem of addiction, but the root of the problem with addiction, I heard a pastor say, is that we are trying to replace what only God can provide with something else. I’ve been mentally taking notes (and also writing things down here and there) of how I spend my day – what I do, for how long, etc. And it was a sad (and shocking) realization of how much time and energy is invested in things that are not going to bear any fruit. I spend a heckuva lot more time in doing mindless screen watching of various forms, than spend time in prayer. We’re all hungry for something deeper, but we all make the mistake of searching for satisfaction elsewhere. Instead of turning to God, we turn to something created by human hands. And we think we find comfort. We think we find satisfaction. Yet after a while, our hearts are restless again. Our new house isn’t big enough. Our new car isn’t fast enough. Our new job isn’t paying enough. This new relationship isn’t fulfilling enough. A drink is no longer enough. And the Truth is, God is the only source that can satisfy the this hunger. As St. Augustine once wrote, Our hearts are restless until they find rest in God. So what may be some things you have tried to unintentionally (or intentionally) replace God with? How have you been trying to satisfy your hunger for something deeper?